Greetings from A Reasonably-Priced But Still Very, Very Nice Hotel Room in San Francisco. It’s a barnstorming trip; one night only. I’m here for the iPad 2 Event. I’ll be covering it for the Sun-Times and the TWiT Network. Then I’ll buy this week’s new comics, I’ll sneak in dinner with a friend, and then I’m off on the redeye tonight. Look, there’s another reason for this post: I’m testing out my new jerry-rigged “Laptop iPad” setup. If it weren’t for the need to liveblog, this is the sort of trip that my iPad excels at. I’ll just be gone for a night or three and there’s a well-defined set of objectives. 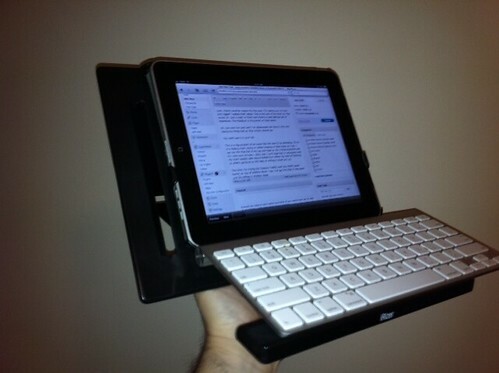 The iPad, plus my Bluetooth keyboard, is all the computer I need; my MacBook is thousands of miles away. You can’t use it in your lap. This is a big problem at an event like the one I’ll be attending. I’ll be in a folding chair, trying to either liveblog or take notes as I go. I can lay the iPad flat in my lap and type on the virtual keyboard and it’s sort of okay, but I can’t type fast or accurately and my brain quickly gets disconnected from either the task of listening to what’s going on or the task of writing it down as I go. This time, I’m trying the Scosche FoldIO case (my iPad’s usual home) on top of Griffin’s iRizer. Yes: I’ve got the iPad in one easel and it’s sitting in another easel. It just goes to prove that while I lack the bravery and sense of duty of the journalists in the Middle East, who are choosing to stay behind in a zone that was dangerous enough before waves of rebellion and desperate, violent government backlash swept through the streets…at least I’m willing to suffer a little. My Usual iPhone, for doing iPhone-ey things. My loaner iPhone 4, for actually sending video (so I’ll have a 100% fresh battery on both iPhones for their intended purposes. T-Mobile’s new 4G Samsung phone, for use as a WiFi hotspot, so that I stand a chance of getting through without being clobbered by all of the thrashing of AT&T and Verizon that’ll be happening all around me. Speaking of hope, I’m writing this with the iPad version of the WordPress app. Previous versions of this app hold the current course record of Screwing Up In Stroke-Inducing Ways. The last edition I tried had evolved from “losing posts as I was writing them” to “destroying posts that had already been published to my blog by other apps” and here, I set something on fire and then moved on with my life. But that was ages ago. I’d rather use a good app than the web client when I liveblog (starting at about 9:30 AM Pacific time). [Edited to add: No, of course it didn’t work. I know that the WordPress app is free software, and it’s the result of the generous contributions of the WordPress and iPad communities…but I’m just dying for a version of this app that functions as it should. A for Effort, but otherwise…oof.